This is something for dogs who are already confident swimmers and this is the basics to getting your dog to jump off a dock. There are many aspects to becoming a successful dock jumper. Start with building a strong camaraderie between you and your dog. Develop a relationship that continues to build trust and confidence. Become a team. Teamwork, diet and conditioning are the foundation for a successful dock jumper. Although there is much more information available on advanced dock jumping, this will focus on what it takes to get your dog to jump off a dock and the proper technique to jump off the end. Remember to always keep it fun. This is something you want your dog to look forward to. Something your dog gets excited about. This is not a time for discipline. Discipline can be worked in to more advanced dock jumping, but for now stay away from discipline. Use this time for teaching and rewarding. Start by playing with his/her favorite toy on dry land. Get him/her to chase it while still in your hand. Slowly begin holding the toy higher in the air continuing to have him/her chase it. Raise the toy high enough so he/she has to jump for it. Praise him/her when he/she jumps for it. Now take it to the shoreline. Do exactly what you did on dry land only this time make sure he's/she’s playing in the water just deep enough to make some splash. Make sure to make plenty of splashes. Praise him/her when he/she jumps for it. Now sit and make him/her stay a small distance from the shore on dry land. Stand a couple of inches in the water. Hold the toy high enough out in front of you so he/she has to jump to get it out of your hand. Release him/her. Because you are in the water, he/she will land in the water. Praise him/her. Your dog is now jumping in to the water. It’s just a matter of progression from there. Set him/her a little farther back and hold the toy a little higher. Once you feel confident with this practice, It’s time to bring him/her to the dock. The key to getting your dog to jump off the dock is to start short and end long. Position him/her at the very end of the dock where he/she will jump and work back to the ultimate starting position. Start by tossing the toy close to the dock. If you toss the toy too long, the dog won’t jump thinking he/she can get the toy. If he/she sees the toy close to the dock, he’ll/she’ll think he/she can get it and will have a better chance of jumping. Once you’ve positioned him/her at the end of the dock where he/she will jump off, toss the toy about 5 feet from the end of the dock and release him/her. If he/she doesn’t jump, go back to the shore exercise. If he/she jumps you’ve done it. Congratulations. Now it’s just a matter of repetition. Toss the toy a little further and have him/her start a little further back each time. Always keep an eye on his/her take off position on the dock. You want him/her jumping as close to the end as possible. If he/she starts to jump early, move his/her start position closer to the take off and start working him/her back again. Nicely written article. Just remember, every dog is different and might need different techniques for your dog. Find what works best for you if you are interested and Brian or myself would be glad to help you get involved. Here's a couple shots of my boy jumping. Also, if your dog doesn't jump as far as Maximus or Rajah, don't get discouraged Bonding and having fun is what really its all about. That's a pretty far jump for a first timer. I agree , I have the most fun just bonding and meeting new people. Do you know any good resources for getting started. I was working with Django a lot before we moved from California and he was fairly proficient at jumping of the diving board, and going off the dock. Just as I was researching clubs we moved. I have found a handful of people in my area who are interested in starting a group, but none of us really know were to begin. What equipment do we need, what sort of time commitment are we looking at? Any pointers? I live in a rural area so not a lot of dog clubs (ok pretty much none). I have spoken with the leader of the 4H dog program and she thinks we could maybe work with 4H. Do you think that would be a good or bad idea? Sorry for the rambling. Lots of questions all at once. Thanks for your wisdom! Hi, Siberian pointed me to your post....I am the President, Founder and Trainer for the Bay Area Diving Dogs, the first Dock Diving club in the SF Bay Area. I founded the club 3 years ago when I found a love for the sport w/my bc Gunner. I built the club from the ground up with the help of many wonderful club members. I'm going to try my best to reply to your questions....There is an ISE in Salt Lake in March - are you anywhere near there? That would be a great chance to meet w/experienced jumpers to discuss your questions. I am always around if you wish to talk privately - just shoot me an private message. In order to get started, you don't need much but a body of water and a dock. Location is your number one item! That can be either a pool, a pond, the ocean, a lake etc. It really depends on what you have available to you. At our current location, we have use of a lagoon and a public dock. The dock is not in the best condition (cracking on top from the water) so I purchased some indoor/outdoor mats to use to protect the dogs feet. All of the handlers usually bring their own toys but I do keep a bag of them handy in my car, just in case we loose one to the tide. I purchased some hardware to make some props to help the dogs in our club w/their jumping - it depends on how much training your club wishes to provide. Things like measuring tapes, props etc can be assessed as the club grows. What sort of time commitment are we looking at? Depends on what you want to commit. Events are throughout the year, it is up to you how many you go to each year. If you are planning on forming a club, it does take some time to get the logistics of the club situated. Is it going to just be a hobby club where a group of you get together and work on the dogs together or do you wish to advertise this to others and provide training, host events etc? You will need to put rules in place according to your practice location to protect the club and it's members? Figure out who will manage the club, will the club have a BOD, what will happen if the club disolves? Equipment? Money? Will you have someone who will act as trainer? If so, they will have the heaviest time committment. They will need to research training techniques, what works for the different types of jumpers etc. 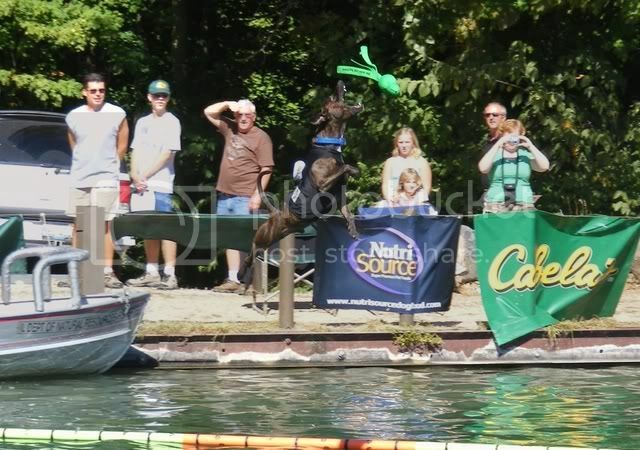 There are a lot of resources on the web to help w/this, visit www.splashdogs.com or www.dockdogs.com and sign up for their message boards, lots of info there. Any pointers? I live in a rural area so not a lot of dog clubs (ok pretty much none). I have spoken with the leader of the 4H dog program and she thinks we could maybe work with 4H. Do you think that would be a good or bad idea? It depends on what requirements they will have of your group? will they run the dock diving club? Will they require insurance? Do they have a location? What is their role in it? Also, I live about 4 hours from Denver and 4 hours from Santa Fe. Would it be wise to maybe connect with an existing club first? It's always good to connect w/an exhisting club or experienced jumpers to see how their club is set up and how they went about finding a practice dock location, new members, training techniques, etc. Our group is in the process of putting in an official training facility, first of it's kind in the Western US. We are so excited. Again PM me if you have more questions - I hope this helps. Woo Hoo! Thanks a bunch for the info! I will def check out the web sites. Wow, thats something i gonna learn my dogs when the weather is okay. 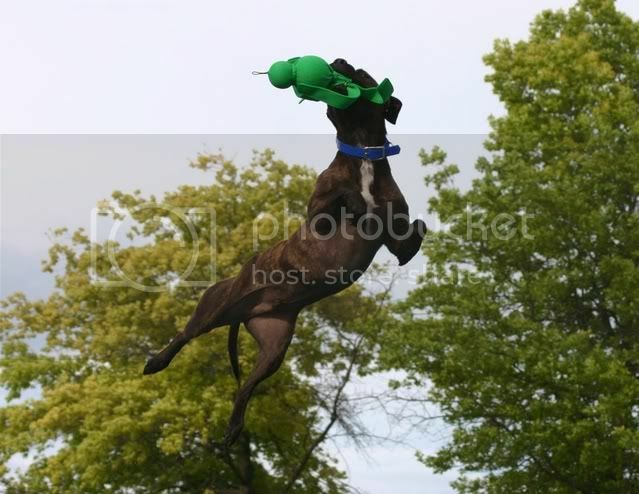 Are there more pics to find from this amazing kind of dogsport???? Also make sure to take a look at the forum. There's always someone posting pics of their doggies there! Urs, this looks like tri-color pit bull. Do you know this dog? He's gorgeous isn't he. That pic was taken back in August of 2006. I have more pics of him that I took myself but can't seem to find them. Absolutely gorgeous dog. Haven't seen him at any of the other events since then. If we can get at least 5 pitbulls to jump 5 times in one year we can actually get an award for top APBT of the year, so we need more Pit Bulls jumping this year. By the way Sheba is jumping so far she may take the cake this year. I know I will get my two their 5 jumps. I know you probably will so we need a couple of more to get it going.